You wanted to copy the text from a blog post. But to your surprise, you find that either you can highlight the text, but cannot right click to copy it or you completely cannot even highlight the text! 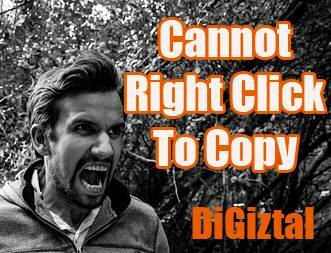 In other words, you cannot copy the text directly from these websites or blogs. I mean those sites where the owners have disabled or encrypted the CTRL +C options to ensure better security from scrapers and malicious sites. They insert Disable Text Selection script or other tools like M File Anti-Copy, Stopper and Prevent in their blog templates, so the text from their sites cannot be copied with your cursor. So you cannot highlight the text on the content and then right-click to copy it. From my own experience and try-out, a couple of those earlier suggestions cannot work anymore. Here is the good news. You can still copy from those right-click protected sites for your own personal use. Yes, you can still enable the protected copy from their blog posts or articles. This easy method to copy text from protected web page that still works all this while. Just right click on the page, a small menu box pops up. Click on "View Page Source". You can find the content which you want among the code. Another easy trick to copy text from web page that cannot be copied. Go to the page you want to copy with Firefox, press the "Cltr" and "S" key together. The "Save As" box pops up. Select the "Save as Type:" as "Text Files(*txt,*.text)". With Firefox, you can easily bypass no right-click feature. At the address bar, at the end of the page URL, you can see the small opened book icon called "Enter Reader View". Click on the icon. Instantly it opens a new page with just the content you wanted. Install the plug-in called “RightToCopy”. This superb tool will allow you to copy content from any site that locked with copy protection. Another easy to install and use plug-in that can help you to copy from those right click disabled websites. This extension works only for Chrome. It CANNOT work for Firefox. This is another easiest way to copy text from some websites that have encrypted with no-copy feature. Use Firefox to open the particular site or page with protected copy which you like to copy. Go to toolbar, click "View". From the drop-down menu, select "Page Style". From "Page Style", click on "No style". Immediately you can see the copy of that particular page change. Now you can use your cursor to highlight the text. After you are done, go back to toolbar, click on View. Select Page Style and this time click on Basic Page Style. The text will revert back to its original protected copy. Note: This method may NOT work for some sites. Disclaimer: DO NOT use the above methods to scrap content. You can copy online content only for personal use. Copyright infringement is a crime.